Happy Solstice and Pollinator Week! I realize that it’s hard to “see” or imagine the finished piece(s) while they’re still in progress. Truthfully, I usually have no idea what the finished work will look like until it’s complete! But at very least, I can tell you that these are intended as jewelry components. The little butterflies and at least one of the bees will become pendants or necklaces, while the wings will be used in some of my earring designs. I’m leaning toward a bracelet for the bee on the blue background, though that may change by the time I complete them all. Oh, and there are some bee wings and a luna moth that didn’t make it into the photo. Halloween 2015 Commission Info Coming Soon! * The bad news (just to get it out of the way) is that commission slots will be very limited this season. My apologies in advance, but I’m taking on several new commitments this fall, and I know that I’ll need to be protective of my health and sanity if I’m to accomplish all that I hope to! * The GOOD news is that I’ll start accepting custom orders again very soon, and past customers will get first dibs on those commission slots. If we’ve worked together before – and especially if we have already discussed your idea – your project will have priority. Stay tuned, as I’ll be posting more details soon! 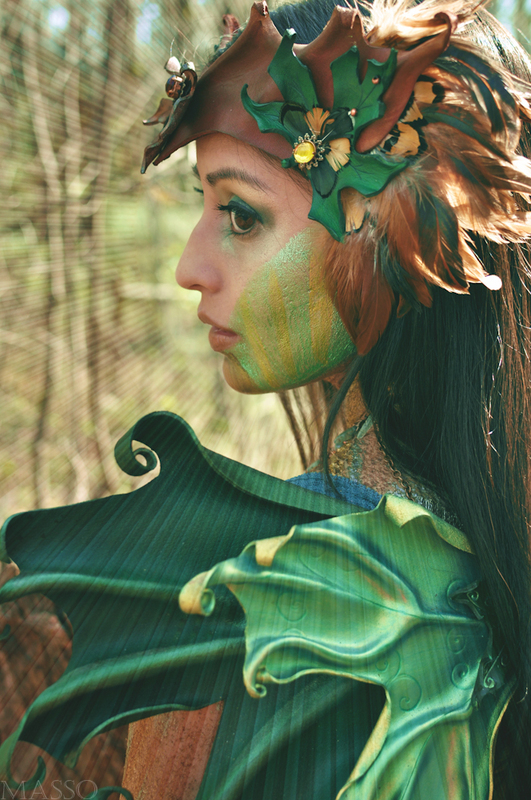 This is one of my favorite photos from a recent “Dryad” themed shoot with the fabulous Michelle Masso, of Kramer Studios. 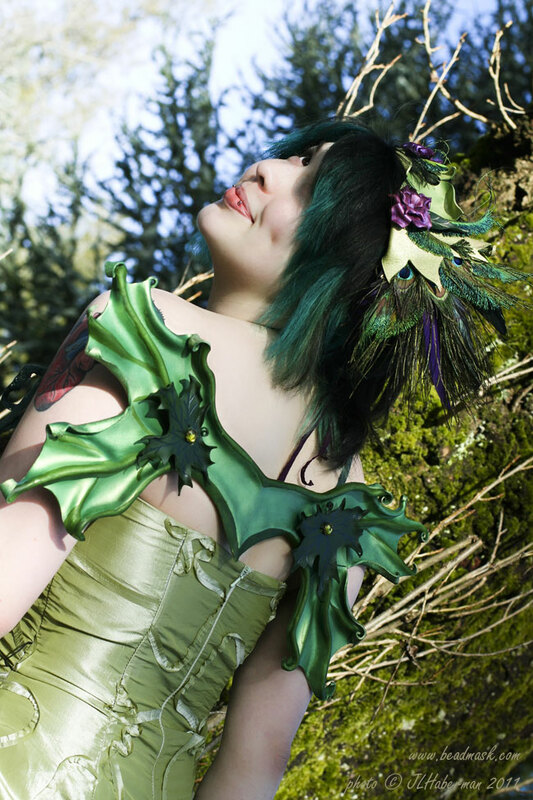 The model is wearing one of my leather headdresses, along with a pair of my sculpted leather wings. If you’d like to see more, please hop on over to my facebook fan page to view the full album! School has been taking a lot of my focus and energy of late, so my creative time has been very limited. It’s somewhat uncomfortable, since being creative is really how I process the things that are going on in my life. I tend to think a lot (sometimes to the point of over thinking) so making is a very soothing process for me; my hands get moving and my mind begins to still. It helps me to relax, to sift out my ideas and to find solutions. Without this outlet, I get a little high strung. That feeling has been hitting critical mass lately, and I’ve been out of sorts. Irritable, restless and generally feeling unproductive and uninspired. 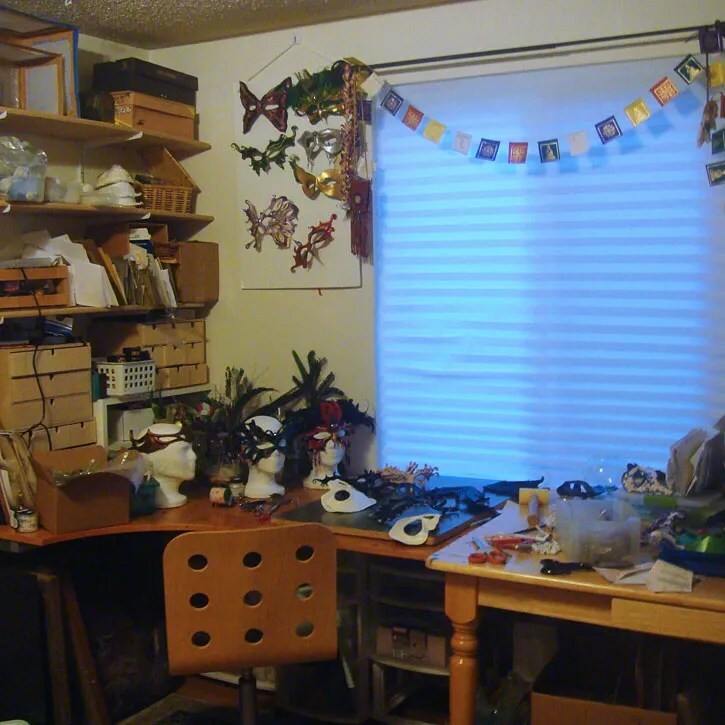 I was really starting to get stressed out about this, when I took a second look at my studio. I began to realize that I haven’t stopped being creative, I just haven’t been able to complete as much with the limited studio time. I’m able to peck away at a variety of projects here and there, I’m just not finishing as many of them. As you can see by the photos here, I have quite a lot of pieces “in progress” that are piling up. The masks above and the hair toys below represent just a fraction of the projects in my studio right now. 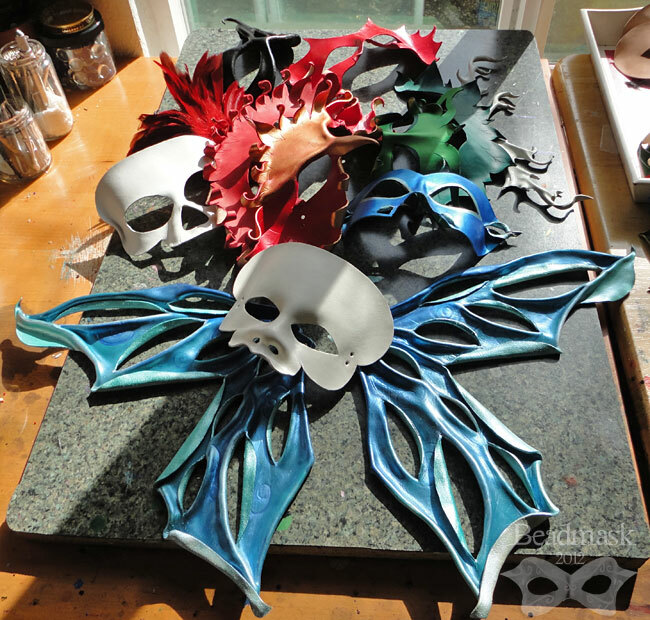 A quick count tells me that my unfinished projects include at least 12 odd masks, 7 pair of wings, 6 or 7 crowns and headdresses, and more hair toys than I can count. That’s not even counting beadwork or leather jewelry (let’s not even go there). It’s typical for me to have several projects going on at once, since I tend to group things in “stages”. For example, I’ll cut out several patterns at once, then shape, then paint, then embellish them in “groups”. Groups of this size are unusual, though. I’m thinking this may be where some of my restlessness and dissatisfaction is coming from. It’s ironic how often the state of my studio parallels the state of my head and heart 😉 I think that the clutter in my creative space is cluttering up my head! So I’m making a commitment to whittle this pile down by at least half within the next month. It’ll clear up some work space, and hopefully open up room for some fresh attitudes and ideas as well. It’s exactly one week till Halloween (home stretch!) and I’m definitely feeling the effect of the last 2.5 months of non-stop mask making. As this photo suggests, my studio is feeling it too! I typically work within a certain degree of controlled chaos, but at this point in time, any semblance of “control” is long gone … my workspace is just flat out chaos. I had to clear a path just to get this shot. That said, I’ve decided to slow down a bit. We’d considered setting up at the Fremont Sunday Market today, but it was pouring rain this morning and R is just getting over that flu bug. So instead of doing the show, I’ll get my studio in order and put finishing touches on a few custom orders. 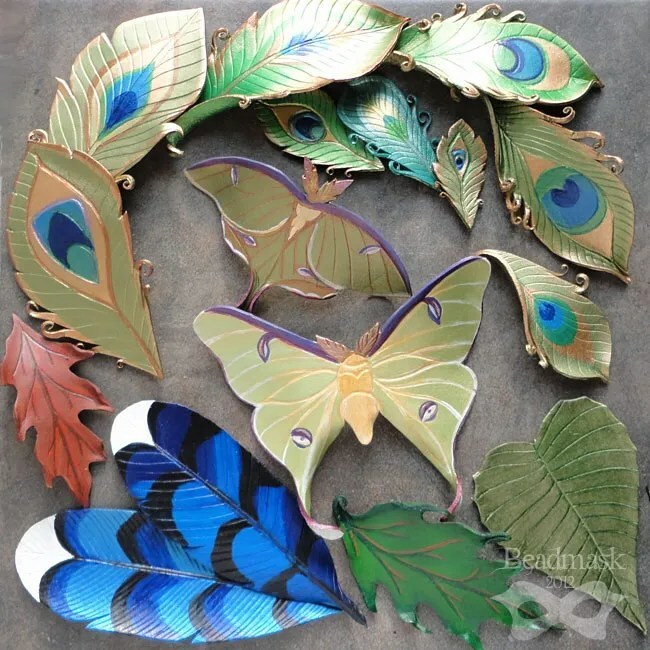 If I have time and energy, I may mess around with those dark faerie wings that have been sitting on my worktable for the last few months … or possibly the sugar skulls that I started, but haven’t had time to complete. 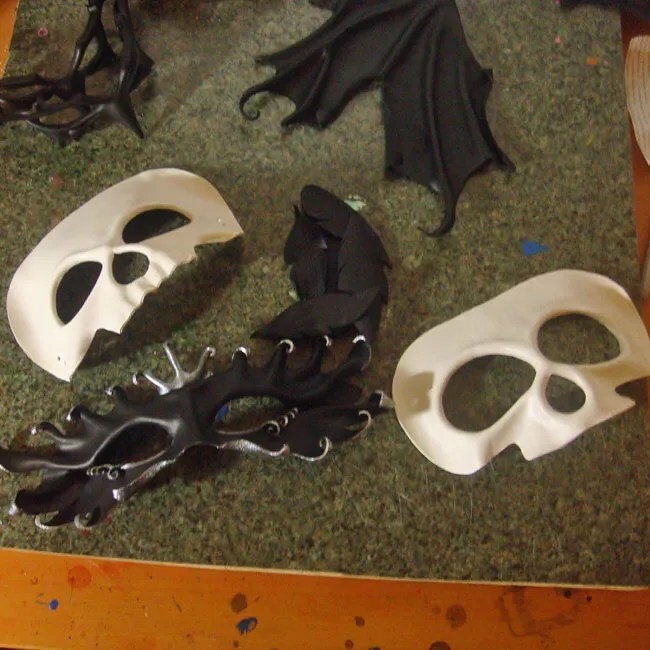 There’s also a raven queen mask that’s just begging for final details.